This boat tournament is characterized by friendly but serious competition. Up to four anglers per boat can register for the event. Cash prizes and trophies await the first- through third-place teams. Auctions and raffles are to highlight the event, whose proceeds benefit the Coral Shores High School band program. In this light-tackle challenge, awards await the grand champion team (boat), first runner-up and second runner-up team, captain and mate, as well as those recognizing the high-point angler, outstanding catch, largest tuna, dolphin and kingfish, most tagged sailfish and hard luck. This event is "almost too much fun for old guys to handle." Locally called the Flutie, the tournament has donated $428,000 to local and national charities. Anglers age 50 and over are welcome. Presented by the Islamorada Fishing Club, this is the final leg of the Florida Keys Gold Cup Series, with a typical field of up to 30 boat teams of elite sport fishermen. A total cash payout for a full field at the IFC Sailfish Tournament could reach $30,000. Big king mackerel migrate to the waters around Key West each winter, and a fittingly large prize awaits the winner of this challenge. The angler who weighs in the heaviest mackerel, also known as kingfish, is to go home with $10,000. Tournament anglers are to compete to catch the most inches of snook and redfish on fly in a competition where one inch equals one point. 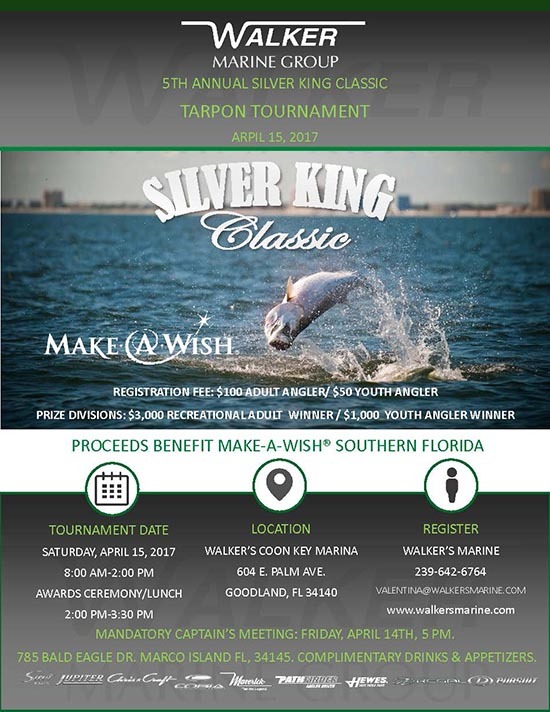 Awards are to be given for grand champion, runner-up to grand champion, and largest snook, and redfish. The field is limited to 30 boats. A new, family-formatted boat tournament that is to feature nine offshore target species. Trophies are to be offered top boats in weight and release categories, as well as private vessel and charter divisions. A junior release division is also planned for anglers up to age 10. Hosted by Jimmy Johnson, two-time Super Bowl winning coach and former head coach at the University of Miami, this prestigious event benefits the Sylvester Comprehensive Cancer Center, a South Florida-based cancer-related research, diagnosis and treatment facility. All anglers on the winning boat receive authentic, custom-designed Jimmy Johnson's NBC Championship rings. Anglers vie for top-honor trophies for catches of bonefish and redfish in this newly formatted event, appealing to a broader spectrum of anglers. Divisions in the tournament's new format include bait, artificial and fly. Awards also are to be given for total release points for each species and to the high-point angler for each day. To be counted toward bonefish and redfish trophies, each fish caught and released must be at least 18 inches in length. An overall grand champion is to be named for both bonefish and redfish in the three categories. A charity flats-and-fly-only tournament with a twist - in addition to catch and release, anglers earn extra points for tagging their caught fish. Held at the Key West Harbour Yacht Club on Stock Island. :: Fly Fishing :: Fishing Articles :: Fishing Photos :: copyright © ci-interactive All rights reserved.